Claire Stancliffe plays in defence for Northampton Town Ladies and is a key part of the GB Deaf team. She also coaches in schools and in her spare time responds to emails from Thin White Line. For Claire and her national teammates, there are no certainties when it comes to competing in international tournaments. This year TeamGB finished third at the Deaf World Cup held in Italy. But they only made it thanks to a successful crowd-funding campaign, supported by some donations from high profile professional footballers. Now, Claire and the team are asking for help to attend the 2017 Deaflympics in Turkey. The team receives no funding from the UK government or Russian oligarchs. Thin White Line recently corresponded with Claire about the financial challenge of competing internationally and about her own football career. We started by asking her about her background in football and her success with the GB Deaf football team. How did you first come to be involved in football? Were you inspired by any particular person or footballer growing up? My parents are big football fans so I always used to play in the park and it was on in the house all the time. I remember watching Stevie G in the number 17 shirt for Liverpool. He was my main childhood hero alongside Michael Owen (one of my fav TV programmes was Zero to Hero). I played in both girls and boys school teams as I was deemed better than most of the boys. My first proper club was Vicarage Farm u16 girls, so I joined at quite a late age. After one season I was approached by Rushden and Diamonds Centre of Excellence u16s. How did it feel when you were first selected in the GB deaf team? It was an incredible feeling. I couldn’t believe it at first as I had literally only played 11-a-side football for two seasons before making an international team. It completely changed my outlook in life. You were named SkySports Sportswoman of the Month in July. What does it mean for you personally, and what do you think it might mean for recognition of deaf football? It was a complete shock to just be nominated, let alone to win the award. I beat professional sports women such Serena Williams. For me, it wasn’t about winning personally. It was about raising awareness, letting people see that it doesn’t matter what you have, it’s what you do that counts. I hope it’s raised awareness of GB Deaf football so that more people know about us. 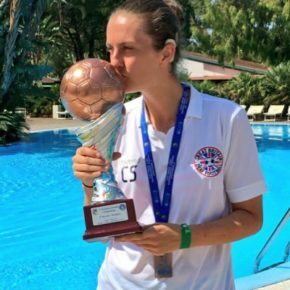 The GB Women’s Deaf Football Team finished third at the recent Deaf World Cup. Do kids give you a bit of extra respect now when you’re coaching them? I don’t tend to tell children about what I do as I am very modest. I don’t make a big deal out of it. However sometimes I use it as a motivational tool. Showing children that a disability shouldn’t stop you from achieving things. That it’s not just about physical skills, other skills such as personal, social, creative, cognitive are all important parts of an athlete. I wouldn’t say it gives me more respect. I think it changes their outlook on how they approach school and everyday life. I make sure they are aware that I’ve had to work hard, not just in PE but in all subjects and respect is a big part of sport. Talking to people in the right way and being kind. The team successfully raised funds for the team to go to the World Cup. Does that give you encouragement when it comes to raising funds to go to the 2017 Deaflympics? It certainly does. It’s given me a belief that there are kind people out there who will help by either donating or spreading the word. The challenge for the Deaflympics is a lot bigger, it’s a big jump trying to raise £125,000. But on the back of TeamGB and their success in the summer, I’m hoping that more people will be aware of us and supportive. To help send Claire and TeamGB to the 2017 Deaflympics, you can make donations at their JustGiving page.